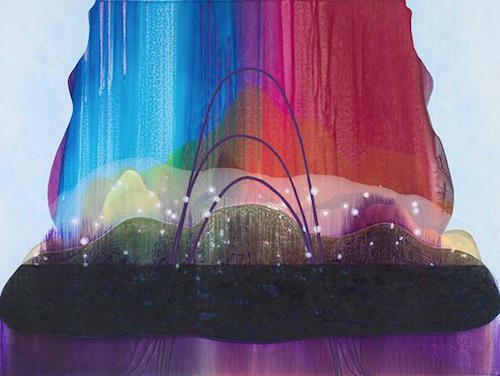 Carrie Moyer, Intergalactic Emoji Factory, 2015, acrylic and glitter on canvas, 72 x 96''. Titled “Sirens,” Carrie Moyer’s new show of vibrant abstract paintings evokes the winged women of Greek mythology who caused shipwrecks with their beautiful singing, luring hapless sailors to their island’s rocky reefs. The work has a loud allure, pairing psychedelic tide pools—complex layered areas of stains, washes, gauzy patterns, and marbleized ooze—with the graphic blare of ultrasaturated, solid matte forms and wavy armatures. The jewel-toned Conflagration with Bangs, 2015, features a drippy take on a fiery O’Keeffian close-up, framed by a structure with green-gold Gumby legs, or, as its title suggests, a geometric hairstyle with blunt fringe. Moyer sometimes accents her decidedly acrylic looks with glitter. In Intergalactic Emoji Factory, 2015, it’s applied to a blob-like edifice, twinkling against a blue and fuchsia sunset; in Red Hot Plot Hole, 2016, it forms a scabby crust on a watery crimson shape that looks like a heart-shaped keyhole surrounded by dark velvet. Her compositions are rich with allusions to abstractionist herstory, especially Helen Frankenthaler’s pour paintings and the central-core imagists of 1970s, while also reflecting Pop and countercultural styles. One sees tie-dyed fabric, blown glass, the illuminated depths of lava lamps, and Milton Glaser’s Dylan poster here, as well as more recent digital design aesthetics. Moyer founded the queer-activist public-art duo Dyke Action Machine! with photographer Sue Schaffner in the ’90s, plastering New York City streets with lesbian riffs on familiar ad campaigns—it’s fun to look at this group of paintings in light of those ingenious interventions. Moyer’s fluid synthesis of idiosyncratic references makes for a kind of deep agitprop, critical menace roiling beneath its varied gorgeous surfaces.